A Marian apparition is a reported supernatural appearance by the Blessed Virgin Mary. The figure is often named after the town where it is reported, or on the sobriquet given to Mary on the occasion of the apparition. Marian apparitions sometimes are reported to recur at the same site over an extended period of time. In the majority of Marian apparitions only one person or a few people report having witnessed the apparition. Exceptions to this include Zeitoun, and Assiut where thousands claimed to have seen her over a period of time. Some Marian apparitions and their respective icons have received a Canonical coronation from the Pope, most notably Our Lady of Lourdes, Our Lady of Fátima, Our Lady of Guadalupe, Our Lady of Perpetual Succour, Our Lady of Manaoag, Our Lady of the Pillar, Our Lady of Walsingham, and many others. Sandra L. Zimdars-Swartz describes an "apparition" as "a specific kind of vision in which a person or being not normally within the visionary's perceptual range appears to that person, not in a world apart as in a dream,...but as part of the environment, without apparent connection to verifiable visual stimuli." According to Zimdars-Swartz, since the increase in Western Christianity in the tenth and eleventh centuries of devotion to the Mother of God, the figure most often seen has been the Virgin Mary. Robert Orsi states that an apparition is a conjunction of transcendence and temporality where the transcendent breaks into time. A public, serial apparition is one in which a seer not only says that they have experienced a vision, but that they expect it will reoccur, and people gather to observe. Zimdars-Swatrz notes that this appears to be a relatively recent phenomenon. Up until about the seventeenth century, most reported apparitions happened when the individual was alone, or at least no one else was aware of its occurrence. In some apparitions an image is reported absent any verbal interaction. An example is the reported apparitions at Our Lady of Assiut in which many people reported a bright image atop a building. Photographs at times suggest the silhouette of a statue of the Virgin Mary but the images are subject to varying interpretations, and critics suggest that they may just be due to various visual effects. However, such image-like appearances are hardly ever reported for visions of Jesus and Mary. In most cases these involve some form of reported communication. And apparitions should be distinguished from interior locutions in which no visual contact is claimed. Interior locutions consist of inner voices. Interior locutions are generally not classified as apparitions. Physical contact is hardly ever reported as part of Marian apparitions. In rare cases, a physical artifact is reported in apparitions, such as the image of Our Lady of Guadalupe, which is reported to have been miraculously imprinted on the cloak of Saint Juan Diego. Our Lady of La Salette, France. According to the doctrine of the Roman Catholic Church, the era of public revelation ended with the death of the last living Apostle. A Marian apparition, if deemed genuine by Church authority, is treated as private revelation that may emphasize some facet of the received public revelation for a specific purpose, but it can never add anything new to the deposit of faith. The Church may pronounce an apparition as worthy of belief, but belief is never required by divine faith. The Holy See has officially confirmed the apparitions at Guadalupe, Saint-Étienne-le-Laus, Paris (Rue du Bac, Miraculous Medal), La Salette, Lourdes, Fátima, Pontmain, Beauraing, and Banneux. According to Father Salvatore M. Perrella of the Marianum Pontifical Institute in Rome (who has also served as an expert for the Congregation for the Doctrine of the Faith), of the 295 reported apparitions studied by the Holy See through the centuries only 12 had been approved as of May 2008 (the latest at that time being the May 2008 approval of the 17th- and 18th-century apparitions of Our Lady of Laus). Other apparitions continue to be approved at the local level, e.g. the December, 2010 local approval of the 19th-century apparitions of Our Lady of Good Help, the first recognized apparition in the United States. An authentic apparition is not believed to be a subjective experience, but a real and objective intervention of divine power. The purpose of such apparitions is to recall and emphasize some aspect of the Christian message. The church states that cures and other miraculous events are not the purpose of Marian apparitions, but exist primarily to validate and draw attention to the message. Apparitions of Mary are held as evidence of her continuing active presence in the life of the Church, through which she "cares for the brethren of her son who still journey on earth." Possibly the best-known apparition sites are Lourdes and Fátima Since 1862, over sixty medical cures associated with Lourdes have been certified as "miraculous" by the Catholic Church, which established its own Medical Bureau in 1883 to review and evaluate claims of cures. Although an independent study of cures reported in the twentieth century noted that the number of reported cures had declined over the years, likely due to advances in medical science as well as criteria that excluded some cures (such as cures of terminal illnesses) during a period of time, the results of the study published in 2012 concluded that some of the cures were "currently beyond our ken but still impressive, incredibly effective, and awaiting a scientific explanation." Our Lady of Pontmain, France. The diocesan bishop can initiate a process on his own initiative or at the request of the faithful to investigate the facts of an alleged apparition. The bishop may refrain from looking into it if he chooses, especially if he thinks that not much will come of the event. The national conference of bishops may intervene if the local diocesan bishop refers it to him or if the event becomes important nationally or at least in more than one diocese. The Apostolic See (the Vatican) can also intervene at the request of the local bishop himself, at the request of a group of the faithful, or on its own initiative. According to Rev. Perrella, the local bishop usually manages the investigatory process, working with the help of a commission of experts such as theologians and medical doctors. The investigation includes questioning of alleged visionaries and witnesses; examining the "fruits of the apparitions" such as conversions and alleged miracles and healings; and evaluating "the veracity of the facts" and "the mental, moral and spiritual wholesomeness and seriousness" of the visionary. Upon completing the investigation, the bishop can either declare the apparition is "true and worthy of belief", declare that it is not true, or seek additional help from the national bishops' conference. If the bishops' conference cannot reach a conclusion, the matter is referred to the Pope, who then calls on the Congregation for the Doctrine of the Faith to either advise or conduct its own investigation. According to the International Marian Research Institute of the University of Dayton, in the twentieth century, there were 386 claims of a Marian apparition. Of these, eight were determined to be "constat de supernaturalitate", i.e. approved; seventy-nine received a negative declaration; and regarding the rest no definitive decision was rendered, either because no studies were ever initiated, or more study is needed. Our Lady of Fátima, Portugal. After this initial investigation, if the occurrence meets the criteria, positive and negative, an initial cautionary permission can be granted that states: "for the moment, there is nothing opposed to it". This permits public participation in the devotion in regard to the alleged apparition. Occasionally a distinction is drawn between a purported apparition and a particular devotional practice that develops from it. A local ordinary may find that a devotion is not contrary to the faith, while not ruling on the apparition itself. In the case of Our Lady of Pellevoisin, Pope Leo XIII authorized the use of a scapular and other devotions associated with reported apparitions, but neither the local church ordinaries, nor the Congregation for the Doctrine of the Faith, nor the Holy See, have issued any statement approving the apparitions themselves. This caused some confusion regarding which apparitions have been formally approved by the Roman Catholic Church. Joan Carroll Cruz's, See How She Loves Us: 50 Approved Apparitions of Our Lady (which contained a nihil obstat and imprimatur from church officials), included in its list of supposedly "approved" apparitions some for which "approval for expressions of faith had been granted, though the investigation of the apparition [was] still under way" and noted that bishops historically "implied their approval by permitting churches to be built as requested by the vision". As a result, Cruz's list contains some apparitions, such as Our Lady of Pellevoisin, that have not been formally approved. Marian apparitions are sometimes reported along with weeping statues of the Virgin Mary. One combined weeping statue and apparition, Our Lady of Akita, has received approval by a local Catholic Church ordinary. A 1953 incident of a weeping statue of Mary (without an accompanying apparition) in Syracuse, Sicily was recognized by the Vatican as a "miracle". However, a Vatican official stated in 1985 that "ninety-nine percent of these [weeping statue] cases were due to collective hallucinations, a play on light, a chemical phenomenon and, sometimes, even the speculation of people with few scruples." 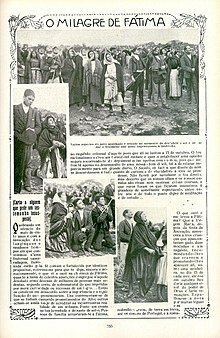 The Marian apparition of Our Lady of Fátima on a remote mountain top to three young Portuguese children in 1917 also seemed fanciful and the local administrator initially jailed the children and threatened that he would boil them one by one in a pot of oil. However, over the years the effect of Fátima has been undeniable. With over 25 million registered Catholic members, the Blue Army of Our Lady of Fátima (which was approved by Pope Pius XII in 1947) is the largest Marian Society in the world. And the message of Fátima has inspired the spread of other devotions. An example is Our Lady's Rosary Makers formed by Brother Sylvan Mattingly in 1949 with $25 to distribute free rosaries, based on his devotion to Fátima. Our Lady's Rosary Makers has since distributed hundreds of millions of free rosaries to Catholic missions worldwide. The Sanctuary of Our Lady of Fátima is one of the largest Marian shrines in the world. Marian apparitions are also responsible for tens of millions of Marian pilgrimages per year. According to Bishop Francesco Giogia the majority of the most visited Catholic shrines in the world are vision based, in that, with about 10 million pilgrims, is the Basilica of Our Lady of Guadalupe, in Mexico City, considered the most visited Catholic shrine in the world in 1999, now followed by the Sanctuary of Our Lady of Fátima, in Cova da Iria, Fátima, Portugal, with between 6 and 8 million pilgrims per year. The Sanctuary of Our Lady of Lourdes, in France, received 5 million visitors per year. In Canada, millions of Americans and Canadians have visited the national shrine of Our Lady of the Cape, in Cap-de-la-Madeleine, Quebec, where the first pilgrimages began in 1888. A number of feasts based on historical traditions involving apparitions are celebrated in the Roman Catholic Church. These apparitions do not technically fall in the Congregation for the Doctrine of the Faith approved category, since they generally predate the formation of the Congregation for the Doctrine of the Faith in 1542. They are recognized based on the papal declaration of the feast day rather than formal analysis by the Congregation for the Doctrine of the Faith. In the year AD 40, according to tradition, the Virgin Mary appeared to Saint James the Great, in Zaragoza, Spain. The vision is now called Our Lady of the Pillar and is the only reported Marian apparition before her Assumption. The Basilica of Our Lady of the Pillar was built in Zaragoza, Spain and a key piece of Roman Catholic Marian art, the statue of Our Lady of the Pillar, refers to this apparition. Our Lady of the Snow is based on a legend that during the pontificate of Pope Liberius, during the night of August the 5th, snow fell on the summit of the Esquiline Hill in Rome. Based on a vision that night, a basilica was built in honour of Our Lady, on the spot that had been covered with snow. The church built there is now the basilica of Santa Maria Maggiore, and the feast was celebrated at that church for centuries on August 5 each year. However, there was no mention of this alleged miracle in historical records until a few hundred years later, not even by Pope Sixtus III in his dedicatory inscription. According to Michael Ott, writing in the Catholic Encyclopedia,"it would seem that the legend has no historical basis." However, in the 14th century the feast was extended to all the churches of Rome and finally it was made a universal feast by Pope Pius V.
Under the 1969 revision of the General Roman Calendar this date is now a commemoration of the Dedication of the Basilica of St Mary Major, although the earlier feast under the 1962 edition of the Roman Missal, is authorized privately and, under certain conditions, publicly by the motu proprio "Summorum Pontificum". According to the tradition of Our Lady of Walsingham, the Virgin Mary appeared in a vision to Richeldis de Faverches, a devout Saxon noblewoman, in 1061 in Walsingham, England, instructing her to construct a shrine resembling the place of the Annunciation. The shrine passed into the care of the Canons Regular sometime between 1146 and 1174. Late in 1538, King Henry VIII's soldiers sacked the priory at Walsingham, killed two monks and destroyed the shrine. In 1897 Pope Leo XIII re-established the restored 14th century Slipper Chapel as a Roman Catholic shrine. The Holy House had been rebuilt at the Catholic Church of the Annunciation at King's Lynn (Walsingham was part of this Catholic parish in 1897). Today there are two shrines at Walsingham: the Roman Catholic shrine centered on the Slipper Chapel and the Holy House maintained by the Church of England. There are also two separate feast days: September 24 in the Roman Catholic Church and October 15 in the Anglican Communion. According to Dominican tradition, Our Lady of the Rosary appeared to Saint Dominic in 1208 in the church of Prouille, in France and presented him with the rosary as a weapon against heresy. The Bollandists, on trying to trace to its source the origin of the tradition, found that all the clues converged upon one point, the preaching of the Dominican Alan de Rupe about the years 1470–75. "Though Mary’s giving of the rosary to Saint Dominic is recognized as a legend, the development of this prayer form owes much to the followers of Saint Dominic." In 1571 Pope Pius V instituted "Our Lady of Victory" as an annual feast to commemorate the victory of Lepanto, the victory being attributed to Our Lady. In 1969, Pope Paul VI changed the name of the feast to Our Lady of the Rosary. In 1917, Our Lady reportedly appeared over several months to several young shepherds in Fátima Portugal reportedly identifying herself as the "Lady of the Rosary." 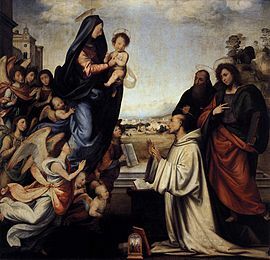 According to Carmelite tradition, the Blessed Virgin Mary appeared to Saint Simon Stock, who was Prior General of the Carmelite Order in the mid 13th century. The earliest reference to the tradition of his Marian apparition, dating from the late 14th century, states that "St. Simon was an Englishman, a man of great holiness and devotion, who always in his prayers asked the Virgin to favor his Order with some singular privilege. The Virgin appeared to him holding the Brown Scapular in her hand saying, 'This is for you and yours a privilege; the one who dies in it will be saved.'" A scapular is an apron-like garment that forms part of the Carmelite religious habit, and in the original context the Blessed Virgin Mary's promise was an assurance that religious who persevered in their vocation would be saved; beginning in the latter half of the 16th century the small devotional scapular became very popular as a sacramental. The historicity of Saint Simon Stock's vision is disputed, and as a result today neither the liturgy for the Feast of Our Lady of Mount Carmel (which originally had no association with scapular devotion, but became strongly connected with Saint Simon Stock's vision in the 17th century), nor that of Saint Simon Stock make any reference to the vision of Mary or the scapular. The Brown Scapular itself remains warmly approved and recommended by the Catholic Church. The 1531 apparition of Our Lady of Guadalupe was reported by Saint Juan Diego. He saw an early morning vision of the Virgin Mary in which he was instructed to build an abbey on the Hill of Tepeyac in Mexico. The local prelate did not believe his account and asked for a miraculous sign, which was later provided as an icon of Our Lady of Guadalupe permanently imprinted on the saint's cloak where he had gathered roses. Over the years, Our Lady of Guadalupe became a symbol of the Catholic faith in Mexico and the Mexican diaspora. The title Our Lady of Šiluva refers to both a fifteenth century icon of the Madonna holding the Child Jesus, and to an apparition which purportedly occurred in 1608 in Siluva, Lithuania that led to the discovery of the hidden icon. At that time, the area was largely Calvinist, the local Catholic Church having been destroyed some forty years previous. The Blessed Virgin is said to have appeared on two consecutive days at the site where the last priest had buried for safekeeping a box containing church property. In the intervening years memory of the box had faded, however news of the apparition prompted an elderly man to recall where he had helped the priest bury it. As important as finding the icon, was the discovery of the property deeds that allowed the parishioners to recover the church land. Pope Pius VI confirmed the authenticity of the apparition of Our Lady of Šiluva by a papal decree promulgated on August 17, 1775. Devotion to Our Lady of Šiluva was suppressed during the period that Lithuania was part of the Soviet Union. She remains a significant symbol of Lithuanian cultural heritage. The apparitions of Our Lady of Laus between 1664 and 1718 in Saint-Étienne-le-Laus, France, to Benoîte Rencurel, a young shepherdess are the first Marian apparitions approved in the 21st century by the Roman Catholic Church. The apparitions were recognized by the diocese of the Roman Catholic Church on September 18, 1665. They were approved by the Vatican on May 5, 2008. Currently, the site where the apparitions took place receives more than 120,000 pilgrims a year. The vision of Our Lady of the Miraculous Medal appeared to Saint Catherine Labouré in 1830 in the convent of Rue du Bac, Paris. She reported that one night in the chapel, the Blessed Virgin Mary appeared to her and asked that a medallion be made to a design that she dictated. The lady added that, "All who wear this medal will receive great graces." After spending two years examining her claims, her priest eventually took the information to his archbishop. The medal eventually produced came to be referred to as the Miraculous Medal. The front of the medal displays a picture of the virgin as she appeared to Catherine Labouré. The design on the reverse includes the letter M and a cross. "The visions of the Rue du Bac inspired other similar accounts among the French Vincentian nuns during the 1840s. A second Daughter of Charity, Sister Justine Bisqueyburu, reported a similar experience in 1840, that led to the creation of the Green Scapular, associated with healing. The scapular itself was approved by Pope Pius IX in 1870. In 1846 Sister Apolline Andriveaut purportedly received vision at Troyes, France, that resulted in the Red Scapular of the Passion. The apparitions of Our Lady of La Salette were reported in La Salette in France in 1846 by two shepherd children, Mélanie Calvat and Maximin Giraud, followed by numerous accounts of miraculous healings. The Roman Catholic Church investigated the claims and found them credible. Statue of Our Lady of Lourdes at the Massabielle cave, in France. In 1858 Saint Bernadette Soubirous was a 14-year-old shepherd girl who lived near the town of Lourdes in France. Bernadette Soubirous was out gathering firewood in the countryside. She reported a vision of a miraculous Lady who identified Herself as "the Immaculate Conception" in subsequent visions. In the third vision she was asked to return again and she had 18 visions overall. According to Saint Bernadette, the Lady held a string of Rosary beads and led Saint Bernadette to the discovery of a buried spring, also requesting that the local priests build a chapel at the site of the visions and lead holy processions there. Eventually, a number of chapels and churches were built at Lourdes as the Sanctuary of Our Lady of Lourdes—which is now a major Catholic pilgrimage site. The apparitions at Our Lady of Pontmain, France also called Our Lady of Hope were reported in 1871 by a number of young children. In the year 1877 the Virgin Mary was revealed to little girls Barbara Samulowska and Justyna Szafryńska. She appeared several times, speaking the Polish language (as opposed to German; Since in East Prussia German was the main language and there was Polish minority), and explained how important it is to pray and say the rosary. Since then, pilgrims from Poland and other countries, have been coming to Gietrzwałd to see the picture of the Virgin Mary and a spring with claimed miraculous powers. The Catholic Church acknowledged the Vision of the Mother of Christ as real in 1977. The altar sculptures at Shrine of Our Lady of Knock, based on the description of the apparition. Knock Shrine, in County Mayo, Ireland, is the site of a nineteenth-century apparition. On the wet Thursday evening of August 21, 1879, at about 8 o'clock, Our Lady, St. Joseph, and St. John the Evangelist appeared in a blaze of Heavenly light at the south gable of Knock Parish Church. Behind them and a little to the left of St. John was a plain altar. On the altar was a cross and a lamb with adoring angels. The appearance of St Joseph, St John and the Lamb make the apparition unique in church history. The Apparition was seen by fifteen people whose ages ranged from six years to seventy-five and included men, women and children. The witnesses watched the Apparition in pouring rain for two hours, reciting the Rosary. Although they themselves were saturated not a single drop of rain fell on the gable or vision. Subsequent commissions of enquiry set up by the local Bishop and the Catholic hierarchy in Ireland formally approved the apparitions as worthy of devotion, and they were officially recognised by the Catholic church, culminating in the visit of Pope John Paul II in 1979, which he called the ultimate goal of his pastoral visit to Ireland. Only a fragment of the original gable wall remains of the old church. A purpose-built Basilica was designed and built to cater for pilgrims and is served by an international airport, Knock Airport. The visions of the Virgin Mary appearing to three shepherd children at Cova da Iria, in Fátima, Portugal, in 1917 were declared worthy of belief by the Catholic Church in 1930. Seven popes – Pius XII, John XXIII, Paul VI, John Paul I, John Paul II, Benedict XVI and Francis – have supported the Fátima messages as supernatural. John Paul II credited Our Lady of Fátima with saving his life after he was shot in Rome on the Feast Day of Our Lady of Fátima in May 1981. He donated the bullet that wounded him on that day to the Sanctuary of Our Lady of Fátima. Pope Paul VI sent a Golden Rose to the shrine in 1964, and Benedict XVI, on May 13, 2010, prayed in the Chapel of the Apparitions at the shrine and gave a second Golden Rose to Our Lady of Fátima. Before a gathering of more than 500,000 pilgrims, he spoke of the Fátima prophecy about the triumph of the Immaculate Heart of Mary. In 1925, eight years after the Fátima events, Sister Lúcia reported another set of apparitions, which became known as the Pontevedra apparitions. Also Blessed Alexandrina of Balazar reported several apparitions of the Blessed Virgin Mary (following the Our Lady of Fátima request of World Consecration to the Immaculate Heart of Mary). The statue of Our Lady of Beauraing, in Belgium. The 33 apparitions of Our Lady of Beauraing were reported in Belgium between November 1932 and January 1933 by five local children ranging in age from 9 to 15 years. From 1933 to World War II, pilgrims flocked to the little village of Beauraing. The final approbation for the apparition was granted on July 2, 1949, under the authority of the Holy Office by the decree of Andre-Marie Charue, Bishop of Namur, Belgium. These apparitions are also known as the Virgin of the Golden Heart. Our Lady of Banneux, Belgium. The apparitions of Our Lady of Banneux were reported by a young child, Mariette Beco a native of Banneux, Belgium in the 1930s. They are also known as the Virgin of the Poor. The apparitions were approved by the Roman Catholic Church in 1949. Beco reported eight visions of the Blessed Virgin Mary between January 15 and March 2, 1933. She reported seeing a Lady in White who declared herself the Virgin of the Poor and told her: "Believe in me and I will believe in you". In one vision, the Lady reportedly asked Mariette to drink from a small spring and later said that the spring was for healing. Over time the site drew pilgrims. Today, the small spring yields about 2,000 gallons of water a day with many reports of miraculous healings. In February 1594 Mother Mariana de Jesus Torres reported that the Virgin Mary appeared to her at the Conceptionist Convent in Quito, Ecuador, identifying herself as 'Our Lady of Good Success'. The apparition requested that a statue be made in her likeness and made several predictions concerning a crisis in the church specifically a fall in vocations, a lack of availability of the sacraments and a fall in moral standards in the 20th century. [better source needed] The apparitions were approved by the local Bishop, Salvador de Riber on February 2, 1611. In 1991 The Vatican granted the canonical coronation of our Lady of Good Success as 'Queen of Quito' after being petitioned by the Archbishop of Quito. The apparitions of Our Lady of Good Help were reported by Adele Brise in 1859. In December 2010, Bishop David L. Ricken of Green Bay, Wisconsin approved the apparition as worthy of belief, as the first Marian apparition approved in the United States at the local level. In Robinsonville (now called Champion) WI, a young Belgian immigrant woman named Adele Brise was walking through a wooded area when she saw a beautiful woman standing between a maple and a hemlock tree. She saw the lady again on her way to Mass, and walked past her again. After Mass she told her priest about the apparition, and he told her to ask the Lady "In God's name, who are you and what do you want of me?" When Adele walked past the spot again, the Lady was there, and Adele asked what she was told by the priest. The Lady replied, "I am the Queen of Heaven who prays for the conversion of sinners." She gave Adele the mission to teach the children of the area their Catechism, which Adele did faithfully. Soon after, Adele's father built a small chapel between the trees, and later two more churches were built on the spot before the present brick church, built in 1942. The apparitions, attributed to Our Lady of Good Help, were approved on December 8, 2010, by Bishop David L. Ricken of the Diocese of Green Bay. On December 8, 1947, 12-year-old Jacqueline Aubry [fr], her sister Jeannette, and cousin Nicole Robin were among students in L'Île-Bouchard in France whose teacher asked them to spend the lunch hour "praying for France". Although their families were nonpracticing and anticlerical, the girls agreed to their teacher's request; this was a period of intense civil strife in France and many believed civil war was imminent. The girls were saying the Rosary in the church of St. Gilles when they experienced the first of several Marian apparitions. They said they saw a beautiful young lady with long curly blonde hair, accompanied by an angel (whom they later identified as Gabriel) who knelt at her side. Running out into the street, the girls asked two friends to come and see the vision: one, Laura Croizon, was able to see it and became the fourth visionary. The day after the first apparition, labor unions agreed to go into negotiations with the government, and believers credited the apparition and the children's prayers. The visitations went on for six days. They were approved on December 8, 2001, by André Vingt-Trois, then Archbishop of Tours, who authorized pilgrimage and public worship celebrated in L'Île-Bouchard in honor of "Our Lady of Prayer", after a diocesan investigation lasting eighteen months. The weeping statue of Our Lady of Akita apparitions, in Japan. The apparitions of Our Lady of Akita were reported in 1973 by Sister Agnes Katsuko Sasagawa in the remote area of Yuzawadai, near the city of Akita in Japan. In 1973 she reported apparitions of the Virgin Mary, as well as stigmata and a weeping statue of the Virgin Mary that continued to weep over the next six years on 101 occasions. In 1981, the Congregation for the Doctrine of the Faith expressed a negative opinion regarding the supposed supernatural occurrences. However, Bishop Ito believed this to be based on incomplete information, so he submitted additional material and asked the CDF to reevaluate its view. Just before he was scheduled to retire in 1984, and before the CDF had responded to his request, the bishop issued a positive declaration for his dioceses pending Rome's "definitive judgment on this matter." Despite claims to the contrary, the CDF has not given approval to either the events or messages of Akita. In 1990, Cardinal Peter Seiichi Shirayanagi, president of Japan's conference of bishops, told the Italian Catholic magazine 30 Days, "The events of Akita are no longer to be taken seriously." The apparitions of Our Lady of Cuapa began on April 15, 1980, in San Francisco de Cuapa, Nicaragua. The Virgin Mary repeatedly appeared to Bernardo Martinez, a sacristan, and according to the visionary this began when he saw a strange light emanating from a statue of the Virgin Mary in the parish church. In May, when walking through the fields, he claimed that he saw a vision of the Virgin Mary, who encouraged him to pray the rosary and promote peace saying: "Make Peace. Don't ask Our Lord for peace because, if you do not make it, there will be no peace". At this time, Nicaragua was going through a civil war. The Sandinista government was facing armed opposition from the Contras. Bernardo Martinez claimed that the Blessed Virgin Mary ordered him to burn bad books, which was interpreted to mean Marxist books. The auxiliary Bishop of Managua complied with this request. Sandinista commentators responded by describing the apparition as "Saint Mary of the Contras", "Our Lady of Oliver North", and "Our Lady of Cuapa". On November 13, 1982, the Bishop of Juigalpa released an official statement as Bishop of the area where the apparitions took place assuring the faithful of the authenticity of the events. In 2005, Silvio Sirias wrote a novel, Bernardo and the Virgin, based on these events. The Marian shrine dedicated to the Turzovka apparitions, Slovakia. The apparitions of Our Lady of Kibeho began on November 28, 1981, in the African college of Kibeho, Rwanda. The Virgin Mary repeatedly appeared to three teenage students, Alphonsine Mumureke, Nathalie Mukamazimpaka, and Marie Claire Mukangango. The apparition identified herself in the native Rwandan dialect as "Nyina wa Jambo", ( "Mother of the Word"), which is synonymous with "Mother of God." The apparitions communicated various messages to the three girls, urging the people to love each other, asking for prayers to prevent a war, and warning of an apocalyptic vision of Rwanda descending into violence and hatred, which has been interpreted as foretelling the 1994 Rwandan Genocide (in which Mukangango was killed). Following an investigation, the Holy See released the declaration of Bishop Augustin Misago of Gikongoro approving the apparitions to Mumureke, Mukamazimpaka, and Mukangango; other apparitions reported by several other girls and one boy were not approved. (Bishop Misago himself was tried in a Rwandan court on charges that he took part in government meetings planning the genocide, but was cleared of all charges in 2000.) The Marian sanctuary at Kibeho was named "Shrine of Our Lady of Sorrows" in 1992, two years before the genocide. An estimated 500,000 pilgrims visit the site every year. Although the Congregation for the Doctrine of the Faith has not released any official statement on Kibeho, Pope Francis, in an April 3, 2014 meeting with Rwandan bishops just prior to the twentieth anniversary of the genocide, referred to the apparitions, saying, "The mother of Jesus wanted to show herself to your country's children, reminding them of the effectiveness of fasting and prayer, especially the rosary." Maria Esperanza de Bianchini had several Marian apparitions among her many other claimed visions and miracles. In one event, on March 25, 1984, 150 other people also said they saw the Blessed Mother along with Maria Esperanza. The apparition was deemed valid by Bishop Pio Bello Ricardo of Los Teques, Venezuela, in 1987 and Mrs. Bianchini's cause for sainthood was opened on January 31, 2010. Bishop Hector Cardelli, as the local ordinary of the Diocese of San Nicolás de los Arroyos, Argentina approved Marian devotions in his diocese on May 22, 2016, under her title Our Lady of the Rosary of San Nicolás. Prompted by the phenomena of private revelations to a middle-aged housewife, tasked during apparitions and locutions over many years with promoting devotion to the Mother of God under this title. Bishop Cardelli recognized the apparitions as "worthy of belief". Some apparitions have been approved by authorities of the Coptic Orthodox Church. For an apparition to be approved, the Pope of the Coptic Orthodox Church sends an official delegation made of bishops and priests, all of whom must witness the apparition and document miracles associated with it. Our Lady of Zeitoun was a mass Marian apparition that occurred in the Zeitoun district of Cairo, Egypt, over a period of 2–3 years beginning on April 2, 1968, in the period after the six-day war. It was reportedly witnessed by many thousands of people, including Egyptian President Gamal Abdel Nasser, and captured by newspaper photographers and Egyptian television. According to witnesses, the Virgin Mary appeared in different forms over the Coptic Orthodox Church of Saint Mary at Zeitoun for a period of 2–3 years. The apparitions lasted from a few minutes up to several hours and were sometimes accompanied by dove-shaped luminous bodies. Believers claim that there have been some miraculous cures and conversions to Christianity as a result. In a statement dated May 4, 1968, the Patriarchate of Cairo and Kyrillos VI stated that they considered the events at Zeitoun as valid, and that they had received many reports of immediate healings during the reported apparitions. Our Lady of Warraq happened on 11 December 2009, The Coptic Church recognized its appearance. this apparition that it was transmitted live by Christian satellite channels as CTV channel. One of the residents lived near the church saw an unusually bright light as well as a lady of light appearing near the crosses above the church and lighting them up. After a short time, crowds of people gathered and took news from one person to another, The news agencies and Christian channels also covered the event directly on the air. The apparitions of Our Lady of Assiut were also mass apparitions in Assiut, Egypt during 2000 and 2001 and many thousands of witnesses produced photographs of them, which were reprinted in several newspapers. The reports state that during mass, pictures hung on the wall inside the altar, which show St Mary with a dove above her started to illuminate first, then the light from the dove in the pictures started to flow down. The lights thereafter appeared above the church as well and were seen by thousands of people. The Coptic church approved of the apparitions. The Anglican Communion has officially recognized the apparition of Our Lady of Lourdes and has built an Anglican Marian Shrine on the location, relatively close to the Roman Catholic shrine. In September 2008, Rowan Williams, the Archbishop of Canterbury, made a pilgrimage to Lourdes and preached at the shrine. Our Lady of Walsingham, England. Father Alfred Hope Patten, appointed as the Church of England Vicar of Walsingham in 1921, ignited Anglican interest in the pre-Reformation pilgrimage. It was his idea to create a new statue of Our Lady of Walsingham based on the image depicted on the seal of the medieval priory. In 1922 the statue was set up in the Parish Church of Saint Mary and regular pilgrimage devotion followed. From the first night that the statue was placed there, people gathered around it to pray, asking Mary to join her prayers with theirs. In the United States the National Shrine to Our Lady of Walsingham for the Episcopal Church is located in Grace Episcopal Church (Sheboygan, Wisconsin). Our Lady of Walsingham Catholic Church and Shrine in Houston, Texas was named the Principal Church of the Personal Ordinariate of the Chair of Saint Peter on January 1, 2012 when it was established to serve the pastoral needs of Roman Catholics coming from the Anglican tradition throughout the United States and Canada. A Western Rite Antiochian Orthodox parish named for Our Lady of Walsingham is in Mesquite, Texas. Our Lady of Walsingham is commemorated by Anglicans on 15 October. In August 1994 an image became visible on a wall behind the altar of a 137-year-old Anglican stone church in Yankalilla, South Australia. The image was interpreted as Mary's face, shoulders, and abdomen. The image supposedly depicts her holding the crucified Christ in the manner of a pietà. Her gaze is directed toward the tabernacle below, which contains the consecrated eucharistic bread. It is also claimed that an image of a rose appeared at the bottom of the larger image. In December 1996, the Bishop of The Murray blessed the church as "The Shrine of Our Lady of Yankalilla" and it has become a popular pilgrimage site for Australian Anglicans. A list of some notable reports of Marian apparitions that have not received a documented church approval, but have also not been explicitly disapproved, is provided below. Apparitions discussed in this section have not received an official approval from either the Roman Catholic Church or the Coptic Orthodox Church, or in a few cases, received an approval from a local authority that was later called into question. In some cases, a bishop has authorized or the church has otherwise permitted devotions based on a reported apparition, without issuing any statement approving the apparition itself as being of supernatural origin. This list is selective in view of the large numbers of individuals who have reported alleged past and present Marian apparitions. According to tradition, several Marian apparitions occurred in areas of present-day India. In Kuravilangad, a town located in the Kottayam district of Kerala, the Virgin Mary is said to have appeared in AD 335 to a few children tending their flock in the bushes. She asked them to build a church at the place from where a miraculous perpetual spring sprouted, a spring which is said to still exist. The children reported the events to the elders and a church was built there. The fourteenth-century (or, by some accounts, eighteenth-century) shrine of Korattymuthy, also known as "Our Lady with Poovan Bananas", commemorates Marian apparitions that were said to have occurred at Koratty in Kerala. Our Lady of Good Health, also known as Our Lady of Vailankanni. The Basilica of Our Lady of Good Health in Velankanni, Tamil Nadu, in southern India, also has a legend involving a number of Marian apparitions. Pope John XIII elevated the Marian Shrine of Vailankinni to the status of minor basilica. Although there is no historical record of the apparition of Our Lady of Good Health: oral tradition suggests that the Virgin Mary appeared to a Hindu boy in the mid-16th century and that later Portuguese sailors were saved by another apparition. In the thirteenth century the Virgin Mary is said to have appeared in a vision at Thetford Priory in Norfolk, England. Shrine of Our Lady of Guardia. The Sanctuary of Our Lady of Guardia located on top of Monte Figogna near Genoa, Italy, is located on the site of a reported 1490 apparition to Italian peasant Benedetto Pareto. Pareto said that the Virgin Mary appeared to him and asked him to build a church atop the mountain. Pareto at first refused, saying that he was just a poor man, but he eventually built a small wooden structure, which in time gathered many pilgrims and is now contained within a large basilica. In the case of Our Lady of Kazan, legend holds that after the city of Kazan in Russia was destroyed by fire in 1579, the Virgin Mary revealed the location of a missing precious icon to a 10-year-old girl. Two major Russian Orthodox cathedrals, the Kazan Cathedral, Moscow, and the Kazan Cathedral, Saint Petersburg, are consecrated to Our Lady of Kazan, and display copies of the icon. The festivals surrounding Our Lady of Chiquinquirá in Venezuela are based on a piece of wood that, according to legend, grew luminous with the image of the Blessed Virgin in 1709. The Vietnamese legend of Our Lady of La Vang is based on an apparition to a group of Vietnamese Catholics fleeing persecution in the rain forest in 1798. The Basilica of Our Lady of La Vang was constructed on the reported apparition site, located today in the Hải Lăng District of Quảng Trị Province in Central Vietnam. The Sanctuary of Our Lady of Lichen, the largest church in Poland (and the 11th largest in the world) is based on legends of the Virgin Mary appearing to different people in the Lichen area in the early 19th century. Our Lady of Pellevoisin, France. In 1876, a French domestic servant, Estelle Faguette, reported seeing a series of 15 apparitions of the Virgin Mary in the bedroom where she was staying near Pellevoisin, France. When her visions allegedly began, Faguette was terminally ill with tuberculosis and near death. However, in the second apparition, she heard Mary tell her that she would be healed, and she recovered and lived until 1929. In 1983, following a medical and theological inquiry, Archbishop Paul Vignancour of Bourges recognized her recovery as having a miraculous nature. Faguette also said that during a later apparition, she saw Mary show her the design for the Scapular of the Sacred Heart and told her to ask her bishop to encourage its devotional use. The Shrine of Our Lady of Pellevoisin was later constructed near the site of the apparitions. Although Pope Leo XIII eventually approved the scapular and a confraternity to spread its use, according to the University of Dayton Marian Library, neither the local archbishops of Bourges nor the Vatican have made any statement approving the Pellevoisin apparitions themselves. Virgin of Sorrows of Chandavila in La Codosera, Spain. In 1945, two children – Marcelina Barroso Expósito and Afra Brígido Blanco – reported several apparitions of the Blessed Virgin Mary as Our Lady of Sorrows near La Codosera, in the province of Badajoz, Extremadura, Spain. A few years later, the Bishop of Badajoz gave permission for the construction of a large Marian shrine in the place of the reported apparitions (now named as Chandavila). Marcelina became a nursing sister in the Congregation of the Sisters of the Cross in 1975. On October 29, 1945 at 7 pm, 9-year-old Joseph Vitolo was one of a group of children playing outside his home near The Bronx's Grand Concourse. The children saw something floating above a hill behind the house, and when Joseph recited a Hail Mary he immediately saw a young woman whom he identified as the Virgin. He heard her ask him to come back at the same hour for sixteen nights and to pray for world peace. Joseph did so, accompanied by his mother and numerous onlookers. Within a few days, the visitations were receiving worldwide attention and up to 20,000 people attended the nightly vigil. Among those who flocked to the Vitolo residence were Frank Sinatra and Cardinal Francis Spellman. Revered as a saint by the pilgrims, Joseph was frequently asked to cure the sick and injured and would respond by praying with them. The place where Joseph saw the visions was bought by a devotee who created a shrine there, but there was never any official investigation or attempt to confirm the reported visitations as legitimate. Joseph struggled throughout his life, taking various menial jobs to support his family. He continued to visit the shrine at 7 p.m. each evening until age and poor health prevented him from climbing the hill. The apparitions were never officially approved, but the nearby St. Philip Neri church holds special Masses at the shrine on the anniversaries of the first and last reported visitations. Between 1945 and 1959, apparitions of the Virgin Mary as Lady of all Nations were reported by Ida Peerdeman in Amsterdam. Peerdeman said that Mary gave her a short prayer called the Amsterdam Blessing. In 1956, the local Bishop Johannes Huibers of Haarlem subsequently issued a finding of "no evidence of the supernatural nature of the apparitions", which was approved and confirmed several times by the Congregation for the Doctrine of the Faith. In 1974, the Congregation went so far as to issue a statement "invit[ing] priests and laity to discontinue all forms of propaganda with regard to the alleged apparitions and revelations". However, in May 2002, Bishop Jozef Marianus Punt of Haarlem-Amsterdam issued a letter that declared the Amsterdam apparitions as having a supernatural origin. An official of the Congregation has questioned Bishop Punt's authority to make such a determination on the Amsterdam apparitions after the Congregation had already given its decision. On June 4, 1947, seven-year-old Angela Volpini was grazing cattle near her hometown of Casanova Staffora, near Oltrepò Pavese in northwest Italy, when she felt someone embrace her from behind and lift her up. Assuming it was her aunt, she turned around and saw "a woman's face – beautiful, sweet and unknown." The apparitions occurred on the fourth day of every month for ten years, and many were filmed. Volpini's father supported her, but her mother, while believing in the apparitions, feared for the girl's life. The local priest, Gianni Baget Bozzo, believed the child and formed a lifelong friendship with her. He often compared the apparitions to those of Our Lady of Lourdes. On his death May 8, 2009, he left one-sixth of his fortune to Volpini. People who believe in Volpini's experiences formed a devotional organization called Nova Cana—the name invented by Volpini herself—to commemorate the events. The reported 1956 apparitions of Our Lady of America at Kneipp Springs Sanatorium near Rome City, Indiana, USA, to Sister Mary Ephrem Neuzil of the Sisters of the Most Precious Blood, received a positive response from the local bishop and have been approved for devotional purposes by several Archbishops and Bishops. However, no decision has been rendered with regard to the supernatural origin and characters of the reported apparitions. The reported Garabandal apparitions in Cantabria, Spain from 1961 to 1965 were examined by the local Bishop and were declared as not having evidence of being of supernatural origin. However the apparitions were not declared a hoax and the possibility of future approval was left open. At Garabandal, an apparition of Saint Michael, the Archangel was reported first, announcing the arrival of the Virgin Mary, under the title of Our Lady of Mount Carmel. Between 1968 and 1976, a young man named Jesús José Cabrera reported several apparitions at the Our Lady of Graces of Onuva, near La Puebla del Río, province of Seville, Spain. In the last apparition, the message from heaven explains that "Onuva means: Land of Mercy, Land of Mercy!». A shrine has been constructed on the site. The reported apparitions of the Virgin Mary to six children in Medjugorje in 1981 have received significant attention. The Our Lady of Medjugorje messages are published and distributed worldwide and often emphasize five key elements: Daily prayer of the Holy Rosary, Fasting on Wednesdays and Fridays, Daily reading of the Bible, Monthly Confessions and Holy Communion. The reports of visions at Medjugorje were vigorously opposed by the responsible bishop, Bishop Pavao Žanić of Mostar-Duvno. A Commission appointed by him to investigate the apparitions did not come to a definitive conclusion and left the site open to further study. On March 17, 2010, the Vatican announced it was beginning a formal investigation of the apparitions at Medjugorje, with Cardinal Camillo Ruini heading the commission that will study the matter. At Soufanieh, a suburb of Damascus a series of apparitions were reportedly observed between 1982 and 2004, without any approval to date. On May 24, 1985, a group of children playing near a disused castle in the town of Oliveto Citra near Salerno, Italy, heard a baby crying nearby and when they investigated the sound, said they discovered a "beautiful woman" with a baby. They brought their parents and others to the site including a local waitress, who was deeply shaken by the experience and later had some private apparitions and locutions. Over 100 people signed a statement affirming what they had seen that day. These visitations are considered controversial and are still being investigated. Between 1990 and 1995, two young girls – Ivetka Korcakova (born 1978) and Katka Ceselkova (born 1977) – reported several apparitions under the title of The Immaculate Purity on the Zvir Mountain, in Litmanová, a village of northern Slovakia. A Marian shrine has been constructed on the place of apparitions. Some apparition-related sites on the internet exist, often with detailed messages that sound pious, accompanied by testimonies from local witnesses, and even local priests and bishops. However, these representations do not always amount to authenticity or Vatican approval. An example is the website for the apparitions of Mother of the Eucharist in Rome since the year 2000. The website for Mother of the Eucharist includes a clear letter and a photo from Bishop Claudio Gatti who approved the apparition. Yet a more detailed search of the same website produces a letter from the Congregation for the Doctrine of the Faith reducing the said Bishop to lay rank following a series of meetings at the Vatican on this and other matters (e.g. the Bishop's position of marriage for priests). The Bishop now uses the title ordained by God rather than Catholic Bishop. Not all reports of visions and apparitions are taken seriously by church authorities. Claimed apparitions to Maureen Sweeney Kyle of Holy Love Ministries in Elyria, Ohio were denounced in 2009 by the local Bishop Richard Lennon as "not supernatural in origin"; he also "forb[ade] members of the clergy of any ecclesiastical jurisdiction" to celebrate the Sacraments on the site and "admonish[ed] the faithful of the Diocese of Cleveland to cease gathering for any religious, liturgical, spiritual, or devotional purpose" on the site. Purported apparitions and locutions received by the late Veronica Lueken from 1968 to 1994 were declared invalid by Bishop Francis Mugavero, then Bishop of the Roman Catholic Diocese of Brooklyn. Similarly, reports of "Our Lady of Surbiton" claiming that the Virgin Mary appeared every day under a pine tree in England were flatly rejected by the Vatican as a fraud. Disapproved apparitions may attract negative publicity at the location of the apparition. For instance, the latter parts of the reported messages from Gianna Talone were disapproved by the Roman Catholic Archdiocese of Baltimore, and a group of Emmitsburg, Maryland residents started a campaign against Talone and accused her of running a cult. To date, the Holy See has let the Talone matter rest at the local level of the archdiocese. Some alleged visionaries have left the Roman Catholic Church and formed their own independent churches or joined another existing church. Mary Ann Van Hoof, the seer of the Necedah Shrine in Necedah, Wisconsin, had her visions declared false by the local bishop and, when she and her followers refused to abide by his order to desist, she was placed under interdict. She subsequently dissociated herself and the shrine from Roman Catholicism and affiliated instead with an independent local Old Catholic Church. Revelations to Feliksa Kozłowska between 1893 and 1918 reportedly led to the founding of the Mariavite and the Old Catholic Mariavite churches. The Palmarian Catholic Church began after a series of purported apparitions in Palmar de Troya. Fraternite Notre Dame, a Traditionalist Catholic church led by Bishop Jean Marie Kozik, traces its origins to apparitions that were reported in Frechou, France. County Mayo housewife Christina Gallagher reported being visited by the Blessed Virgin with messages for the people of Ireland. In 1992, she purchased a former convent on Achill Island and opened a House of Prayer. Apparently Archbishop Joseph Cassidy of Tuam was under the impression it was to be a small retreat house. In 1996, his successor, Archbishop Michael Near Michael Neary (bishop) established a commission to inquire into claims of supernatural phenomena at the centre. This investigation concluded that there was no evidence of supernatural events. Nonetheless, Gallagher pronouncements became increasingly apocalyptical and she continued to receive substantial donations. In 2006, the government Revenue Commission rescinded the House's charitable exemption status. Also in 2006 Gallagher began to open additional houses in the United States. In 2008, Archbishop Neary issued a clarification that "the ‘House of Prayer’ has no Church approval and the work does not enjoy the confidence of the diocesan authorities." ^ Zimdars-Swartz, Sandra L. (2014). Encountering Mary: From La Salette to Medjugorje. Princeton University Press. p. 4. ISBN 9781400861637. ^ Zimdars-Swartz 2014, p. 5. ^ "Private and public revelation". Catholic Culture. Retrieved January 11, 2012. ^ "Vatican recognizes Marian apparitions in France". Retrieved September 8, 2016. ^ "Wisconsin chapel approved as first US Marian apparition site". Retrieved September 8, 2016. ^ Papal Encyclical Lumen Gentium 62, Vatican. ^ François, Bernard; Sternberg, Esther M.; Fee, Elizabeth (January 2014). "The Lourdes Medical Cures Revisited". Journal of the History of Medicine and Allied Sciences. 69 (1): 135–162. doi:10.1093/jhmas/jrs041. PMC 3854941. PMID 22843835. ^ Editor (February 17, 2011). "How the Church Faces Claims of Marian Apparitions". The Compass. Green Bay, Wisconsin. Archived from the original on November 27, 2016. Retrieved November 27, 2016. ^ a b Cruz, Joan Carroll (2012). See How She Loves Us: 50 Approved Apparitions of Our Lady. Charlotte, North Carolina: TAN Books. p. PT205-211. ISBN 9780895558039. ^ a b "All About Mary: Pellevoisin Apparitions". udayton.edu. International Marian Research Institute, University of Dayton. Archived from the original on April 13, 2016. Retrieved November 27, 2016. ^ Schmetzer, Uli (October 3, 1985). "Few Weeping Madonnas Pass Vatican's Test". Chicago Tribune. Retrieved November 26, 2016. ^ "Popular Catholic Shrines". Retrieved September 8, 2016. ^ "Religion moves 330 million tourists a year and six million go to Fátima", Diário de Notícias, February 19, 2017. ^ "Fátima expects to receive 8 million visitors in 2017", in Sapo20, December 15, 2016. ^ "Introduction". Archived from the original on September 12, 2016. Retrieved September 8, 2016. ^ Andrew Jotischky; The Carmelites and Antiquity. Mendicants and their Pasts in the Middle Ages. Oxford: Oxford University Press, 2002. ^ Fr. Kieran Kavanaugh, OCD, Zenit News Service. Brown Scapular: A Silent Devotion Archived 2009-05-04 at the Wayback Machine July 16, 2008. ^ Herbert Thurston, S.J., "The Origin of the Scapular – A Criticism." The Irish Ecclesiastical Record Vol XVI July–December 1904. pp. 59–75. Dublin: Browne & Nolan, Limited. ^ Bede Edwards, OCDS. Carmel Clarion Volume XXI, pp 17–22. "St. Simon Stock—The Scapular Vision & the Brown Scapular Devotion." July–August 2005, Discalced Carmelite Secular Order, Washington Province. ^ "Phi Vatican recognizes Marian apparitions in France". Catholic News Agency. Archived from the original on 2008-12-12. Retrieved 2008-05-11. ^ "Vatican recognizes Marian apparitions in France". Catholic News Agency. Retrieved 2011-02-20. ^ Paul Likoudis. "Our Lady of Laus Now on a Par with Lourdes". Catholic World News (republished from The Wanderer). Retrieved 2011-02-20. ^ "Expert explains Church's criteria for confirming Marian apparitions". Catholic News Agency. May 8, 2008. Retrieved February 22, 2010. ^ "CATHOLIC ENCYCLOPEDIA: Miraculous Medal". Retrieved September 8, 2016. ^ "Justine Bisqueyburu – Vincentian Encyclopedia". Retrieved September 8, 2016. ^ "HOMEPAGE – Marian Shrine – Knock Shrine – Ireland's National Marian Shrine – Shrine Mayo". Retrieved September 8, 2016. ^ "Pontiff Adjourns Vatican Council and Honors Mary", New York Times (November 22, 1964): 1. ^ "13 May 2010: Apostolic Journey to Portugal on the occasion of the 10th Anniversary of the Beatification of Jacinta and Francisco, young shepherds of Fátima – Holy Mass on the Esplanade of the Shrine of Our Lady of Fátima – BENEDICT XVI". Archived from the original on December 14, 2014. Retrieved September 8, 2016. ^ Fatima Shrine Receives Golden Rose. Zenit, May 12, 2010. ^ "Conceptionists celebrate their 500th anniversary". Archived from the original on 2012-12-01. Retrieved 2011-09-20. ^ "Thousands turn out for procession of Our Lady of Good Success". Archived from the original on 2012-03-28. Retrieved 2011-09-20. ^ Jim Graves. "Marian Messenger". Retrieved 2011-09-19. ^ "Catholic News Service". Archived from the original on December 10, 2010. Retrieved September 8, 2016. ^ Chinon: Death of one of the girls who claimed to see the Virgin Mary. La Nouvelle Republique, March 17, 2016. ^ "Revista Envío – Church-State Relations A Chronology – Part II". Retrieved September 8, 2016. ^ "The Miracle Hunter : Official Church Statements". Retrieved September 8, 2016. ^ "Rwanda Court Acquits Bishop of 1994 Massacre Charges". The New York Times. Associated Press. June 16, 2000. Retrieved November 27, 2016. ^ Wooden, Cindy (April 7, 2014). "On 20th Anniversary of Rwandan Genocide, Pope Urges Reconciliation". Washington, D.C. Catholic News Service. Retrieved November 26, 2016. ^ "The Catholic Review > Life > Metuchen opens sainthood cause for Venezuelan mystic who died in US". Retrieved September 8, 2016. ^ Pillai, Michelle (January 14, 2010). "Life of a Venezuelan visionary and mystic – Jan 17". Catholic News. Roman Catholic Archdiocese of Port of Spain, Trinidad and Tobago. Archived from the original on 2011-07-23. Retrieved September 26, 2010. ^ "Numerous cures were reported by people of many religious faiths and by people of no faith." Coptic Church Review, Vol. 13–17, 1992, p. 42. ^ "Thousands of Egyptians lined up outside the church until the small hours of the morning, hoping to catch a glimpse of the Virgin. Men and women who had lost sons, husbands and fathers during the war sought solace in the apparition, Miraculous cures were reported." Historian al-Sayyid Marsot, writing in 1985, quoted in Anthony McDermott's Egypt from Nasser to Mubarak (RLE Egypt): A Flawed Revolution vol. 3 (Routledge, 1988). ^ Pearl Zaki (1977). Our Lord's Mother visits Egypt in 1968. Dar El Alam El Arabi. p. 24, 27. ^ zoozooz7 (August 24, 2008). "Virgin Mary appears to +500,000 people in Egypt!!". Retrieved September 8, 2016 – via YouTube. ^ "August 2000: Our Lady Appears in Assiut, Upper Egypt". Retrieved September 8, 2016. ^ "Apparitions in Assiut". September 5, 2000. Retrieved September 8, 2016 – via bbc.co.uk. ^ "Holy Lights in Assiut, Upper Egypt (March/April 2006)". Retrieved September 8, 2016. ^ "Miraculous Image of Madonna and Child at Shrine of Our Lady of Yankalilla". Retrieved September 19, 2017. ^ a b Ball, Ann (2003). Encyclopedia of Catholic Devotions and Practices. Huntington, Indiana: Our Sunday Visitor Publishing. p. 515. ISBN 9780879739102. The Confraternity of Our Lady of Pellevoisin was established, and Pope Leo XIII gave approbation both to the confraternity and to the scapular [of the Sacred Heart, associated with the apparition]. ^ a b Burke, Raymond (May 31, 2007). "Regarding Our Lady of America" ((letter to United States Conference of Catholic Bishops)). EWTN. Retrieved November 27, 2016. ^ "St. Mary's Forane Church, Kuravilangad, Kottayam, Kerala, India". Archived from the original on 2013-10-04. ^ "Korattymuthy – Our Lady with Poovan Bananas". Koratty shrine. ^ Internet, LM. "Sanktuarium Maryjne w Licheniu". Retrieved September 8, 2016. ^ Peter Duffy, "The Boy who Saw the Virgin". New York Times, December 22, 2002. ^ Patrice O'Shaughnessy, "Still faithful 65 years after Italian boy Joseph Vitolo witnesses miracle night." New York Daily News, February 22, 2010. ^ Something About Mary. Modern Luxury, October 2012. ^ Joseph Sciorra, Built with Faith: Italian-American Imagination and Catholic Material Culture in New York City (Univ. of Tennessee Press, 2015), p. 21. ^ McGreevy, John T. (2000). "Bronx Miracle". American Quarterly. 52 (3): 405–43. doi:10.1353/aq.2000.0037. JSTOR 30041856. ^ This child who saw the Madonna. In La Provincia Pavese April 6, 2008, p. 35. ^ "I stood close to my mother's room and I saw her talking to a statue of the Madonna, crying 'This is my daughter. You can't do that to her. You've already experienced what it's like losing a son. Leave her alone. '"This child who saw the Madonna. In La Provincia Pavese April 6, 2008, p. 35. ^ Angela Volpini heir of Don Baget Bozzo, in La Provincia Pavese March 12, 2010, p. 22. ^ "Mensajes de Onuva". Retrieved September 8, 2016. ^ "Bishop Pavao Zanic". Retrieved September 8, 2016. ^ Winfield, Nicole (2010-03-17). "Vatican studies visions of Virgin Mary in Bosnia". Associated Press. ^ Paolo Apolito, Apparitions of the Madonna at Oliveto Citra: Local Visions and Cosmic Drama. Pennsylvania State University Press, 1998. ^ I am the Immaculate Purity – The apparitions of the Blessed Virgin Mary in Litmanová (Slovakia) Retrieved on October 1, 2011. ^ Paolo Apolito, The Internet and the Madonn: Religious Visionary Experience on the Web. Translated by Anthony Shugar. University of Chicago, 2005. ^ Eucaristia, Movimento Impegno e Testimonianza Madre dell. "Apparizioni Madonna Mariane Maria Gesù apparizione Italia Roma veggenti veggente Marisa Rossi". Retrieved September 8, 2016. ^ "Proclamation on Holy Love Ministries Will Test Hearts and Obedience". November 20, 2009. Retrieved September 8, 2016. ^ "Our Lady of Emmitsburg Cult Watch – Archdiocese rejects visions in Emmitsburg". Retrieved September 8, 2016. ^ Curran, Timothy (May 5, 1975). "Bishop at La Crosse Moves Against Van Hoof Shrine". The Capital Times. p. 1, cols. 1–3. ^ Curran, Timothy (May 6, 1975). "Mrs. Van Hoof Gets Interdict". Wisconsin State Journal. p. 21, cols. 1–3. ^ "Visitor tracking". Retrieved September 8, 2016. Johnston, Francis W. (1980). Fatima: the Great Sign. Chulmleigh: Augustine. ISBN 0-85172-723-9. McClure, Kevin (1983). The Evidence for Visions of the Virgin Mary. Wellingborough: Aquarian Press. ISBN 0-85030-351-6. Laurentin, René (1991) . The Apparitions of the Blessed Virgin Mary Today. Dublin: Veritas Publications. ISBN 1853901199. Terelya, Josyp (with Michael H. Brown) (1991). Josyp Terelya – WITNESS. Milford, Ohio: Faith Publishing Company/The Riehle Foundation. ISBN 1-877678-17-1. Brown, Michael H. (1992). The Final Hour. Milford, Ohio: Faith Publishing Company/The Riehle Foundation. ISBN 1-880033-03-8. Laurentin, René (1993). The Cause of Liberation in the USSR. Goleta, California: Queenship Publishing Company. ISBN 1-882972-07-4. Blackbourn, David (1994). Marpingen: Apparitions of the Virgin Mary in Nineteenth-Century Germany. New York: Alfred A. Knopf. ISBN 0-679-41843-1. Odell, Catherine M. (1995). Those Who Saw Her: Apparitions of Mary. Huntington: Our Sunday Visitor. ISBN 0-87973-664-X. Brown, Michael H. (1996). The Day Will Come. Ann Arbor, Michigan: Charis. ISBN 0-89283-944-9. Connell, Janice T. (1996). Meetings with Mary: Visions of The Blessed Mother. United States: Ballantine Books. ISBN 0-345-39705-3. Brown, Michael H. (1998). The Last Secret. Ann Arbor, Michigan: Charis. ISBN 1-57918-339-5. Brown, Michael H. (1998). Seven Days with Mary. Milford, Ohio: Faith Publishing Company/The Riehle Foundation. ISBN 1-880033-26-7. Sparrow, G. Scott (2004). Sacred Encounters with Mary. Chicago: Thomas More Association/Ave Maria Press. ISBN 1-59471-047-3. Brown, Michael H. (2007). Tower of Light. Palm Coast, Florida: Spirit Daily Publications. ISBN 0-615-14372-5. Wikimedia Commons has media related to Marian apparitions. This page was last edited on 8 April 2019, at 13:25 (UTC).